Ghosts don’t scare Maddy Deeprose. She’s seen them all her life. 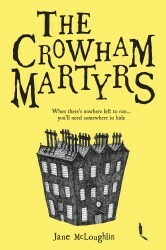 And so when her mum sends her to creepy old boarding school Crowham Martyrs, Maddy isn’t worried. But when her friends start disappearing, Maddy knows it’s time to be scared. Something is lurking at Crowham Martyrs. Something evil. Is the place that is supposed to keep Maddy safe about to become the hunting ground? I loved that the story was suspenseful and kept me guessing to the point where I was reluctant to put it down because I needed to know what happened next.